The Traynor TVM50A is a versatile, multi-purpose AC-powered amplifier that can run on 120V or 230V and travel the world with you. Connect up to 3 signal sources - an acoustic/electric guitar or digital keyboard, a microphone, and an MP3 player or other source of recorded music. 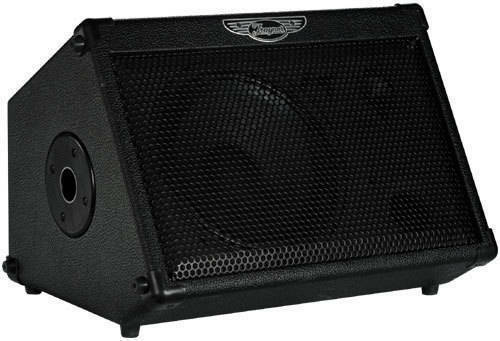 Set it on the floor and its speaker angle turns the TVM50A into a monitor, or set it up on a speaker stand and it becomes a super-compact PA system for live and/or recorded music, also for speeches sales presentations and a host of other functions. Channel one is tuned for vocals with an XLR / TRS combi-jack input for low or high impedance mics plus a Volume control paired with a single sweepable Tone control that boosts intelligibility and overall presence with a minimum of tweaking. Channel two offers a 1/4-inch input with a Low-Z/High-Z input impedance selector so that it can optionally take a second microphone. A combination of Gain and Volume controls let you adjust for a wide variety of input signal sources while 3-band EQ provides ample tone adjustment. And finally, an additional pair of RCA auxiliary Inputs allows quick connection to CD or MP3 players. I have two of them. I had to replace the tweeters with the horns the K-1s have and they work and sound great. Great for monitors as you can stick them anywhere. It would be great if they would operate with their power supplies plugged in with a little less noise, but when the music is up - they blend well. I must have picked up a defective unit, because it works occasionally at home, and when I took it to the store, it didn't work when a sales rep tried it, but a technician was able to make it work. Controls seemed flimsy. 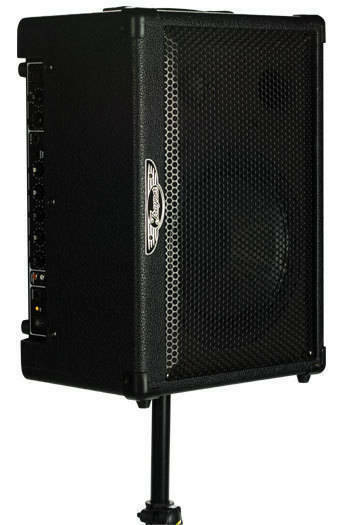 A get what you pay for kind of bass amp. The product description talks about how the amp can double as a monitor, and it seems about on par with a Yorkville 50W floor monitor I bought which seems better built. Used them in a band for keyboard and vocals. They worked great and I had no complaints but the keyboard was also really good as well as the vocal processor that the mics ran through first. 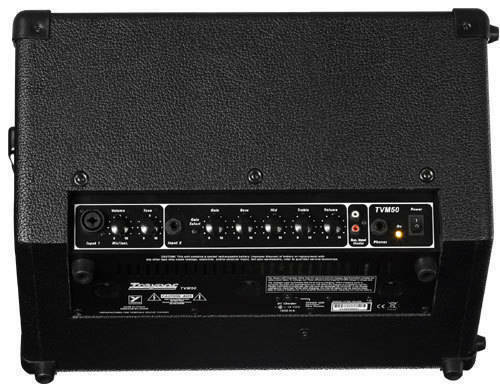 I would really take this amp seriously if it only a balanced out DI. I really like the 10" speaker. This unit would make a nice personal monitor. But without the DI output I will not even try it out.